Howard Mansfield remembers the first time he heard about Harry Atwood. A neighbor told him, “There was this man who lived in Greenfield in the 1930s. He covered an old house top to bottom in cement and stone. He built a swimming pool, floated an airplane in the pool all winter. 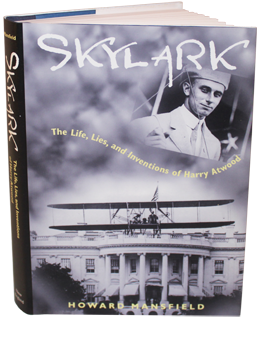 Took the airplane out of the pool, flew to the White House, landed right there, and had lunch with the President.” From this intriguing report—all true, though not in that order—sprang Mansfield’s five years of work on the book. “Like most of the stories Atwood told and the ones told about him, they are made up of truth and lies,” Mansfield writes in Skylark. “But each truth and each lie is enfolded over the other like so many things in nature—flower buds, onions, tree rings, certain rock deposits. Tightly bound layers of deceit and honesty. So tight that what Harry Atwood said was at once false and true. When Harry told a story it was composed much like Duply, thin layers of wood and plastic bonded under pressure until it was so strong it could stop a bullet. So it was when Harry Atwood talked, falsehood and fact, exaggeration and honest report. A chemical formulation that might read: truth-lie-lie-truth-truth-lie.